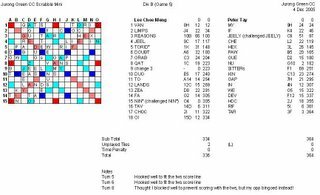 I joined the Jurong Green CC mini to have a taste of Scrabble again as I have stopped playing for a long while. 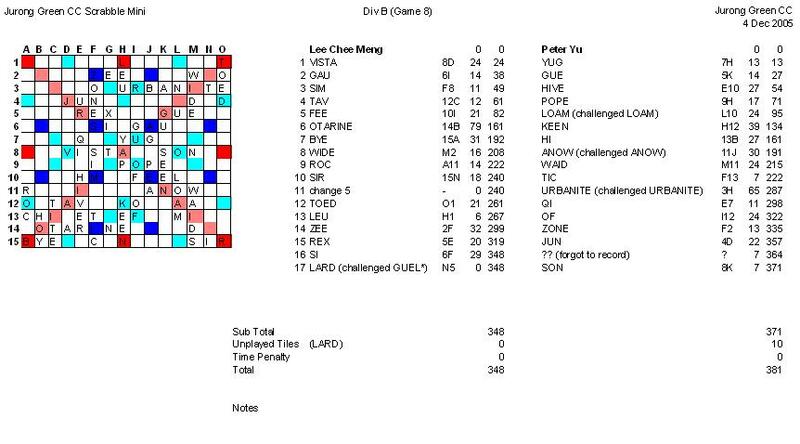 I was quite lucky to be the last person to be placed in div B and to have a round robbin competition, so I had a chance to play with intermediate players like Zi Peng, Marcus and Victor. Chew Chuah is my colleague and he came especially early to play a game before the actual tournament started! 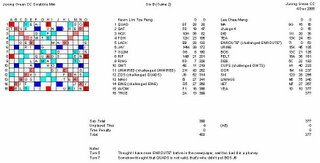 Bingoed with GoALPOST(66) through an existing S at O8. but could have done better with GALiPOTS(80) O1. 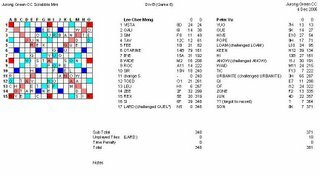 Also missed another bingo AUSTERER(77) through an existing R at A8 but played a phoney UREATES* instead. 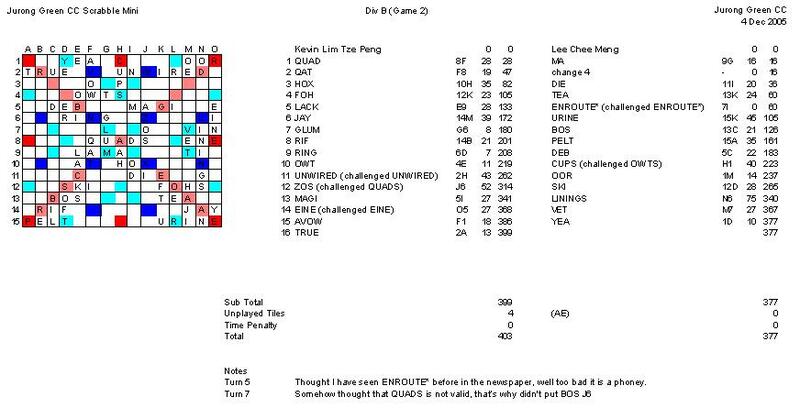 Was leading quite comfortably by about 50 points until Chew Chuah scored well with RIOTERS(90) as bingo and QIS(39). Lost by 7 points in the end. L 391-398, -7. 1 Loss (Accum spread -7). My first time playing with Kevin who was a student at Raffles Instution and he led most of the way. 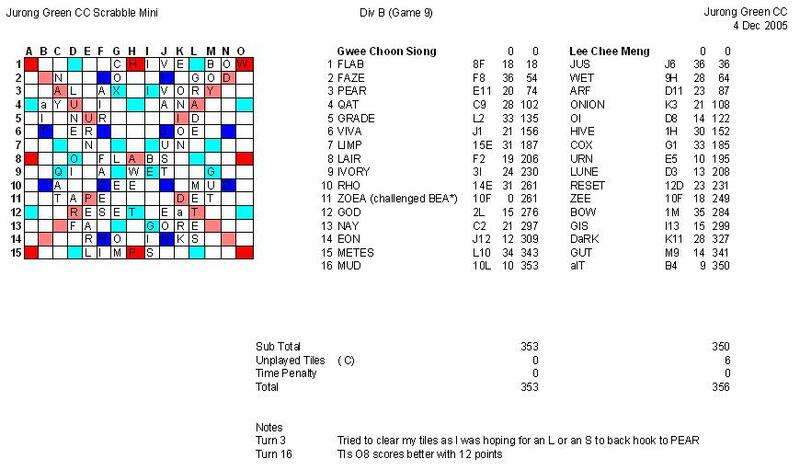 Almost caught up when I bingoed with LININGS(75) but still lost in the end by 26 points. There is a mistake for the scores on toucanet as I wrote the 7 like a 2 on my score sheet. L 377-398, -26. 2 Loss (Accum spread -33). My first time playing with Sharifah who was a pleasant Malay girl. 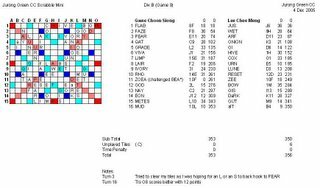 Bingoed with DECLINE(77) but played badly overall as I allowed my opponent to score highly with the X, J and Z. Lost by 39 points in the end. L 349-388. -39. 3 Loss (Accum spread -72). My first time playing with Victor who was a student. Trailed from the very start when my opponent pulled away with RIOTERS(72). We had an exciting finish as both of us bingoed on our last turns. Victor bingoed with LINIEST(80) 6A and I had EEHIRS? on my rack. Could have gotten a nine-timer with my tiles, but I went over time for just over 1 minute to come up with RELISHEd(83). Lost by 54 points with the 20 points time penalty. L 353-407. -54. 4 Loss (Accum spread -126). My second time playing with Peter Tay who was a Masters player. Managed to score well whenever he tried to open up. Was leading with REASONS(66) until he also bingoed with SITTERS(69). Lost by 28 points in the end. L 336-364. -28. 5 Loss (Accum spread -154). My first time playing with Marcus who was a seasoned intermediate player. Didn't have a chance as he got both blanks early in the game and bingoed with THiEVES(84) and FATTIES(96). Managed to bingo with ELATION(65) near the end but it was too late. Lost by 135 points. L 326-461. -135. 6 Loss (Accum spread -289). 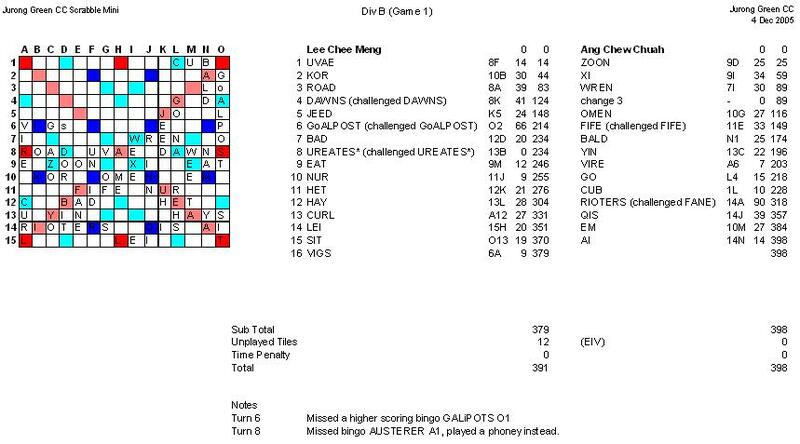 I played Zi Peng several times before on ISC but this was my first time playing with him in an actual competition. 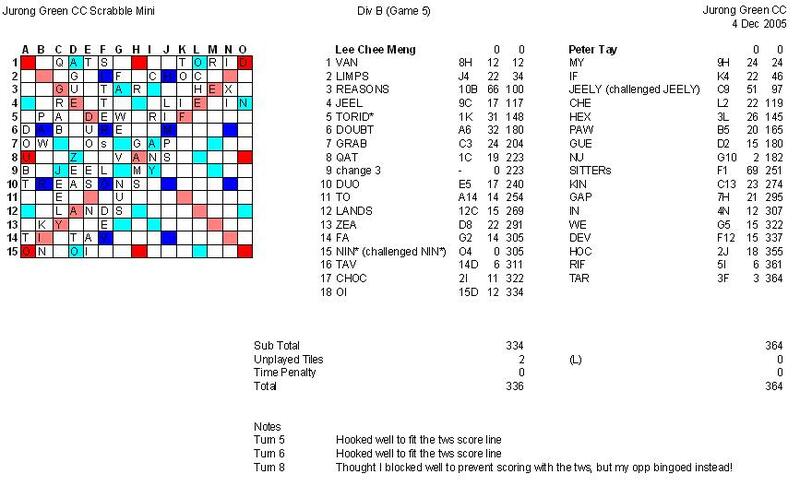 Was leading most of the way when I bingoed with LINGERS(74) but Zi Peng pulled away with DETAINS(76) as bingo. Lost by 56 points in the end. L 348-404. -56. 7 Loss (Accum spread -345). Learnt many new words from Peter Yu whom I played once before. I bingoed with OTARINE(79) and he bingoed with URBANITE(65). In the end, I lost by 33 points. L 348-381. -33. 8 Loss (Accum spread -378). My first time playing with Choon Siong who brought his son along to play too! Learnt later that I edged his son out from the div B competition. Had a very very close game! Our scores were neck-in-neck and none of us had a bingo. I managed to pull ahead when he phoneyed with BEA* and caught him with a C in the end to win by 3 points. W 356-353. +3. 1 Win 8 Loss (Accum spread -375). Had a fun afternoon playing Scrabble, although now I know I definitely need to brush up on my 3s! Came in last but I will aim to do better next time! Do you see the recurring theme in your games? 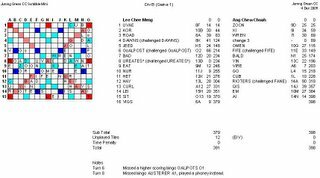 You played at least 1 phony per game, and those that got challenged off were the 3s, which your opponents presumably are familiar with. You actually got away with TORID* (DROIT) when it should be spelt TORRID. Thanks for your advice! Will definitely try to brush up on my 3s, hooks and bingos. 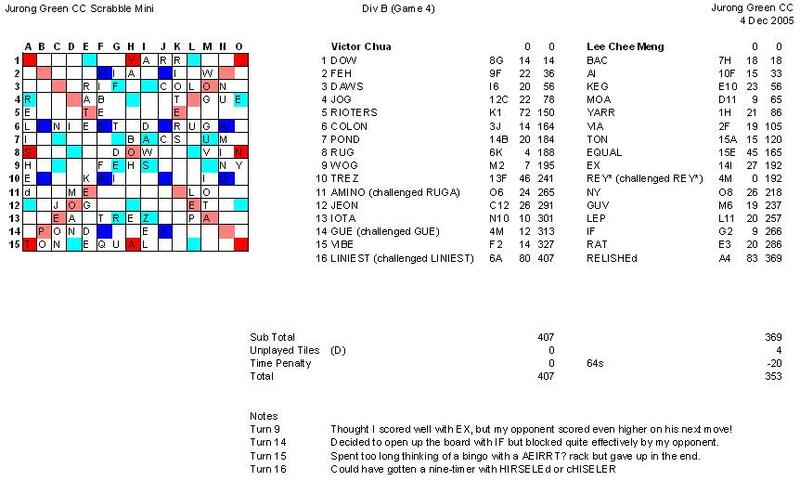 Not sure if I can ever be a masters player, but I'll at least want to be a reasonably good intermediate player. In your game 4, there are back-hooks for RUGA. Both RUGAE & RUGAL are good. 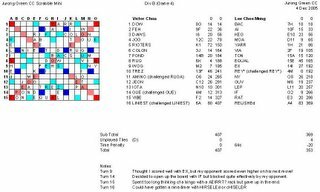 The only difference between a Masters player and an Intermediate is word knowledge. Even the so-called 'strong' intermeds are at best seasoned 'poker-faced' players, they sometimes play words they are unsure of and hope they get through. This includes those Masters player that regularly play in intermed. Don't be intimidated by your opponent. Challenge everything you are unsure of, it will cost you less in the long run. So long as you retain the basics, you will make it to Masters.